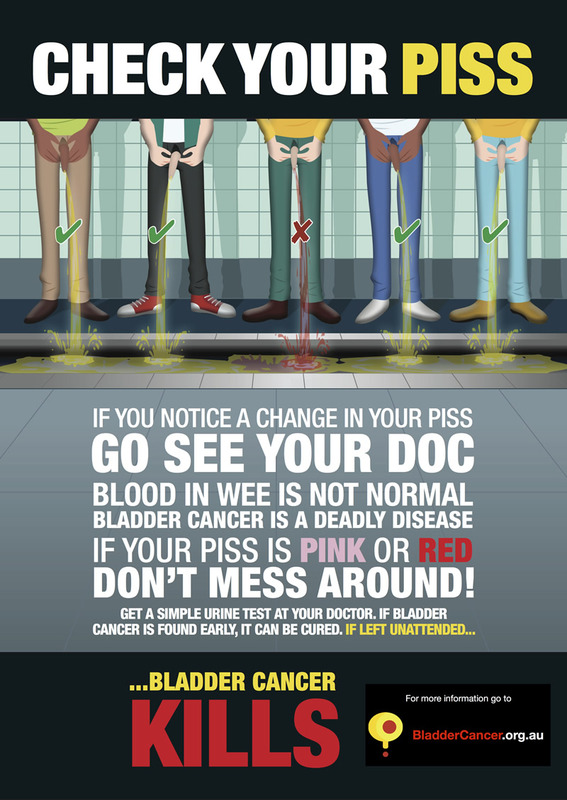 Home > Bladder Cancer Resources > Why is there blood in my pee? Why is there blood in my pee? Blood in the urine does not always mean you have bladder cancer. Often it is caused by other things like an infection in your urinary tract, benign (non-cancerous) tumours, stones in the kidney or bladder, or some other benign kidney diseases. The early stages of bladder cancer can cause bleeding but sometimes little or no pain or other symptoms. The important thing is to see your GP quick smart if you have pink or red urine, or if you have noticed a change in your wee. Your pee might sink in the bowl, or look “heavier”. Get it checked out! When you go to the doctor, he or she will ask you to wee into a specimen jar. He will put a test strip in, and in about one minute he will tell you if there is anything unusual going on, and what the next steps might be. It’s a quick and easy test! If you do have bladder cancer, and it has been found early, you have a way better chance of a full recovery. If you don’t do anything, that cancer can grow, and eat into your bladder wall, and spread through your body.